The ever popular Savage has been updated for 2015 with micro-drop platform for a lower centre of gravity and W-concave keeping feet locked in place. The new graphic is now available in two colour options for this season. The Mindless SAVAGE III Longboard is a high spec downhill board that has been designed to truly perform. The deck has drop through cut outs giving a much lower centre of gravity letting you have maximum control, stability and the ability to respond faster. The superb deck is constructed with 8 layers. At the core of the Mindless SAVAGE III Longboard deck is 6 layers of 100% grade A hardrock Canadian maple whilst the top and bottom layers are bamboo. Similar to the Maverick, the bottom ply is constructed with both smoked and un-smoked bamboo but they have been constructed alternatively giving this stylish zebra stripe finish. The deep concave also has a slight convex to it near the nose so there is no unwanted flex when bombing those hills and the edged top rails utilize the maximum area available to dig in your feet. The seven inch trucks have a reversible hanger so that you can change the caster angle around to give you quicker or slower turning depending on your riding style. Couple this with the 14mm cushions and you have a fully customisable ride. The Mindless Shifta wheels fitted as standard work perfectly with the deck and trucks to give you a smooth ride over all surfaces while giving you enough to grip to carve with confidence. - between four layers of Maple. 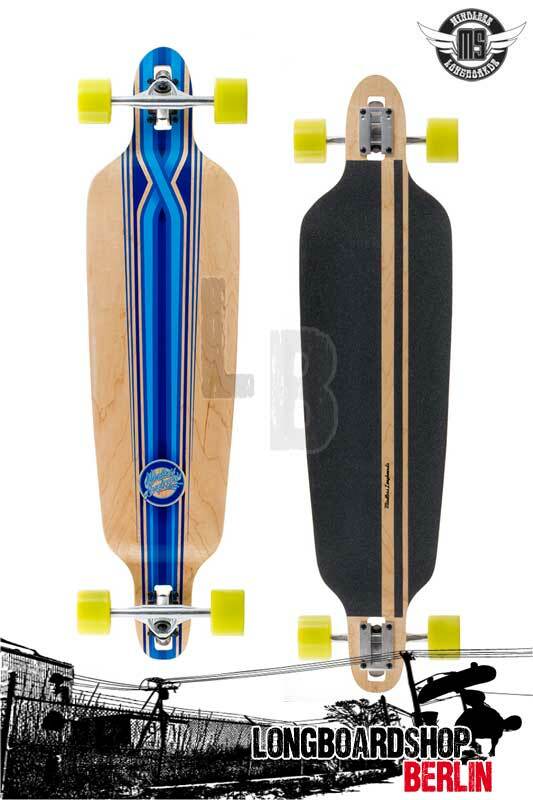 Das Mindless Savage III Longboard Drop Thru Downhill Cruiser - Jetzt bei uns im Shop!